I was 8 yrs old when I first knew that the Irish Setter was THEE Breed for me. I liked many larger breeds (Collies, Shepherds etc) as I was growing up but the red dogs just touched my heart like no other. For years I would read the "Jim Kjelgaard series of Irish Setter books " (Big Red, Irish Red, Outlaw Red) over and over, I would cut pictures of red dogs out of magazines and use them as family pets when playing Barbie with friends. It was not until 1969 that I was finally able to get my first REAL Irish Setter. Had been working a year at the time and was READY. My dad drove me to a nearby town to see a young dog that was advertised for sale. Well he was nice but it was the 4 month old puppy that caught my eye....the owner knew that I was more interested in the little girl puppy and made her available to me. I named her Scarlet. Scarlet and I shared over 14 years together - it was the best time of my young life. Scarlet left me in June of 1983. That same month (knew I could not be with out a dog in my life from that point on) I headed to Delaware to see a litter of puppies - here again I knew the one when I first saw her, another little girl who I called Tracy (Trace of Scarlet). Trace and I shared many happy years, she went a lot of places with me we were quite a team. When the year Tracy turned 8 yrs old I learned that her Breeder was very ill and needed to place all of his older dogs. A friend took one of the older females and I got Tracy's litter sister Jill. My first experience with more than one dog in the house and I found I loved it....Unfortunately Jill's time with me was very short. I only had her a total of 15 months - Jill had Cancer and passed away on November 14 of 1992. My first boy Devin was born on Nov. 10 of '92 - he was only 6 weeks old when his "breeder" drove him from New Jersey to me - he was the only boy in the litter...I was set in my mind this time that I wanted a little boy even tho she brought a few of his sisters along for the ride. A cold rainy December day - pups shivering in the back seat. Anyhow I got my boy out of that woman's car and situation real fast - he was such a cutie...did well with Tracy - so cute to see my nearing 10 yr old gal and this tiny boy pup side by side in the yard, playing tug o war etc. Dev didn't stay little too long and started giving Trace a run for her money. Tracy crossed the bridge in July of 1994...it was 8 days later that I received a call from my Vets office saying that they had received a panic call from a local woman needing to rehome a 3 yr old Irish gal was I interested. I was indeed interested...that very night the owner of this gal drove her to my place. She had been named Brandy by the family children...new life, new dog for me I re named her Tory. Tory & Devin were quite in love with each other from the git go. That first night I slept on my living room couch and during the night Tory climbed up and snuggled into my chest and fell asleep. In 2003 - Tory was then 12 and Devin 10 I was browsing the PetFinder pages and my eyes latched onto a 10 month old pup needing a home. She had been born in Turkey...came to America and briefly lived in Maryland until her mom had to make the very hard decision to rehome her, due to personal circumstances. Something made me inquire about her and that started things on a roll...before I knew it she was heading my way by one of the Rescue folks I renamed her Kylie. Kylie, being a pup was terrible with Tory. Tory wanted no part of it, Dev wasn't too keen on it either..but he coped. As this story went...just 6 weeks later Tory left me...spleen problem. I was devastated....Life went on with Devin and Kylie...and then late in July I came home from work and knew Devin was not right...he was moving around but didn't want to eat and breathing was not like it should be. We went to emergency, they admitted him right away, put him on a breathing machine...in the wee hours of July 31st My baby boy passed away he was just a few months from turning 11 yrs old. I just could not believe..in the course of a short 6 weeks I had lost both Devin and Tory. I called my Rescue group and learned there was a boy (found in Virginia as a Stray) of about 4 in need of a home. The Rescue woman that had delivered Kylie to me had him at her place and she drove him to me....I named him Shane. Shane and Kylie became the new Team....she a year old at that time and he 4 ish.....Life was good the balance of 2003 to the end of 2004 when once again I was looking at Petfinder and spied an 8 yr old gorgeous gal called Faith. She was a lighter red than most Irish Setters and marked with white chest, white toes, white tip to her tail and forehead snippet of white - a field Irish. Like with Ky and Shane, she was brought to me on a December 2004 Sunday. This was my first time as a 3 dog owner. Faith and Shane didn't hit it off right away, Faith from down South was part of a hoard of dogs kept in a Corral, food tossed in to all for a free for all, she had issues with Shane passing by too closely. That didn't last long cos they eventually became best buds as they grew older together. In 2009 Faith started with Degenerative Mylophy - got to the point of having to carry her up and down the stairs but she was eating good and we took short walks and she continued to be my girl. Well in Dec of that year I was thinking Faith wouldn't be with me much longer, she did get through the holidays and into 2010. Just got weaker and weaker and our walks stopped completely. Still had her appetite tho. At the end of Feb. 2010 Shane took ill, x rays showed a huge mass around his heart, he was also starting to cough...Vet was not optimistic at all but sent him home with meds. Shane couldn't keep the meds down, he wouldn't get up off the floor on the morning of March 2nd. Still the same lunch time and I made the decision...that night I said goodbye to him. The very next day I knew Faith couldn't go on, I would carry her outside stand her in place and she would always manage to squat, not March 3rd morning - she just fell over breathing rough. I let her go to the bridge (She and Shane forever together) that evening. March 16th through a Rescue in Tennessee came my boy Mick (he lived in Arkansas) - he rode in a tractor trailer to Carlisle PA and Rescue angel Sandy again came to my rescue - picked him up and drove him to me. I have had Mick now for going onto 2 yrs. He is approx 5-6 yrs old, Kylie is now 9 1/2 yrs old and in Sept. of 2010 my Irish Red and White Setter pup - Cassie arrived from Canada. Back to 3 dogs - I love each and every day with my wonderful loving Irish Setters. Hope to have several more in my life before my time on Earth is done. Carol, I know you think you are the lucky one to be able to share your heart with these deserving furkids, but the reality is that the kids are the lucky ones! What more could a redhead ask for than a safe, loving home with ample supplies of food, toys, and affection? Your story just about made me cry. What a beautiful experience you have had with some of the coolest dogs on the planet. 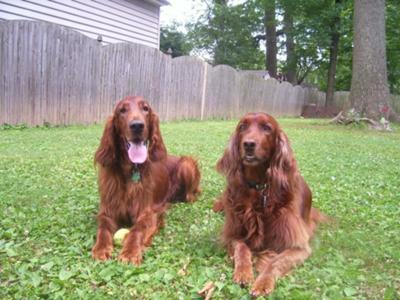 I have never had and Irish Setter, but a friend of mine in Tennessee has 6 and she absolutely loves them. Thanks for sharing this special part of your life with us!